Rail anchors or called rail anticreepers are spring steel clips that attach to the underside of rail tie plates and bear against the sides of rail sleepers. The function of rail anchors is to prevent longitudinal movement of the steel rails, either from changes in temperature or through vibration. Rail anchors are applied to the rail base directly and lodge up against the rail ties. Rail anchors can provide a large bearing surface against rail base and rail ties, preventing cutting and wearing, and eventually to prolong the service life of the rail ties. Rail anchors are made for a specific rail weight and base width, which can be classified into two types: the drive-on rail anchors and spring type rail anchors. 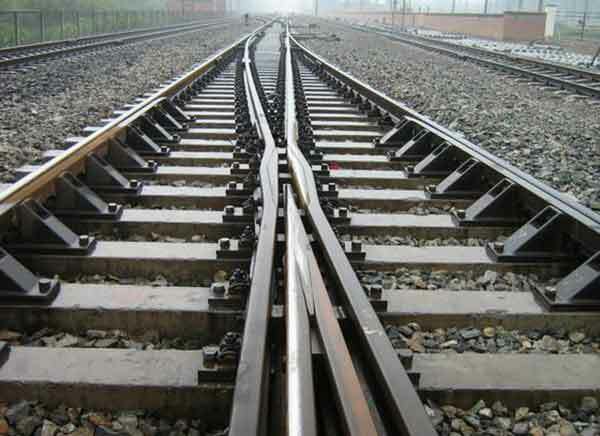 Rail anchors are widely used in railway construction projects to prevent the movements of steel rails. Rail tie plates are welded to the top surface of the bottom flange of the steel rail. 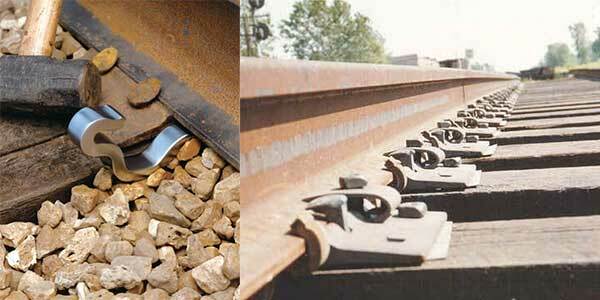 In general, rail tie plates overhang the side of the rail tracks by 100 to 150mm. Blocks of rail anchor are then welded to the rail support surface to prevent the rails from moving longitudinally. These blocks are positioned away from the edge of the rail which has no effect on the sideways adjustment of the rail. The welds to the rail require low hydrogen (or austenitic) electrodes and an appropriate degree of preheat. This will depend on the carbon content or carbon equivalent of the rail steel. 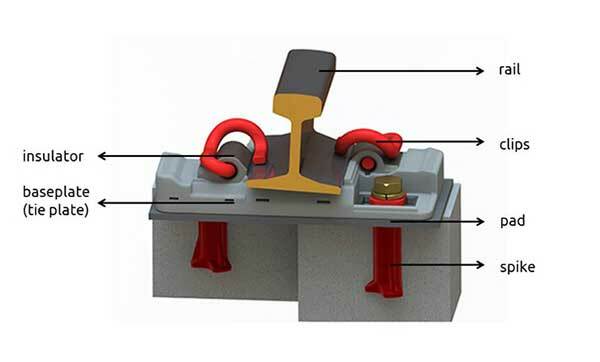 It is necessary to weld the rail anchor point without damaging tie plates under the rail. When installing rail anchors, the rail temperature should be kept below 150˚ C at all times. An alternative to a central fixed point is to use blocks at the end of the rail. These are normally welded to the rail support, some 50 to 100mm from the end of the rail. This is normally a better solution to ensuring rails do not move than the use of a fixed point. Rail anchors cannot be moved by driving them along the steel rail. The railroad ties should be kept straightened when the anchors are applied. Usually, rail anchors are used in certain locations of railway. 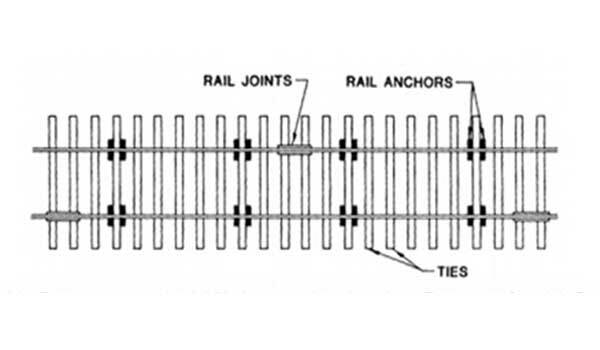 When anchors are used, taking a 39 foot rail as the example, 8 rail anchors are usually commended, as shown in the following diagram. With the increasing of the steep grades, the number of rail anchors may be increased. Rail anchors are used on track approaching open deck bridges, every third tie should be box-anchored for at least two rail lengths off each end of the bridge. As rail crossings where anchors are used, every third tie should be box anchored for at least two rail lengths in all directions from the crossing. Rail anchors are optional used in railway turnouts. 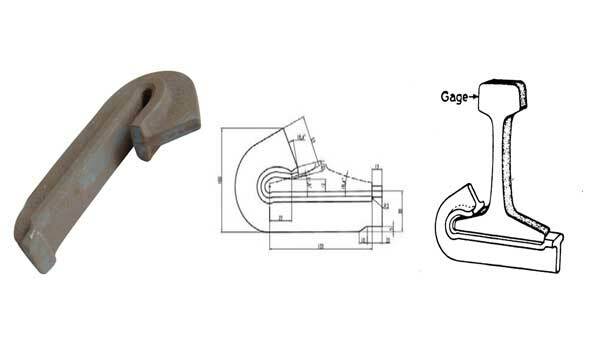 When anchors are used in the turnouts, it is helpful to correct the geometry problems. Rail anchors are manufactured in one-piece construction for spring steel or equal, heat-treated and designed to eliminate creepage of the track. 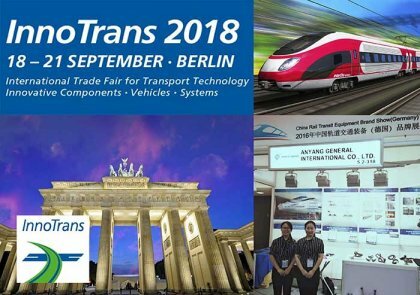 The rail anchors can provide a large bearing surface against both rail base and tie, avoiding undo cutting and wear, thus prolonging the life of wooden ties. Rail anchors are always used in rails such as 50kg, 85kg, UIC54, UIC60, 90/91lb, 115RE, 136RE, just to name a few. We can produce T or V-shaped rail anchors as well as other types according to clients’ requirements, by forging or casting. 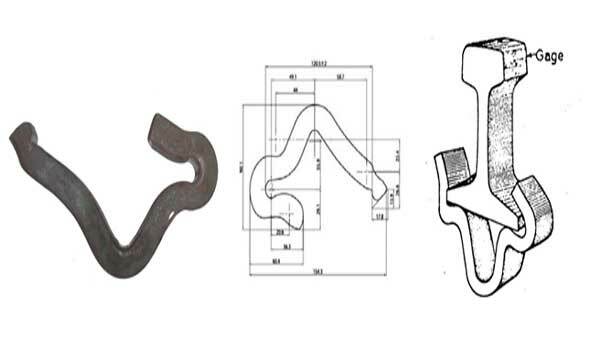 Generally speaking, based on our former production experience, most common material for rail anchor production is 60Si2MnA, which is often used for rails such as 50kg, 70lb, 80lb, 90/91lb and so on. 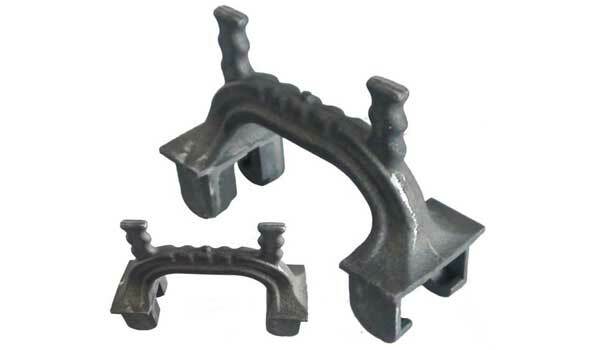 Rail anchors for Russia market: high grade ductile iron castings. 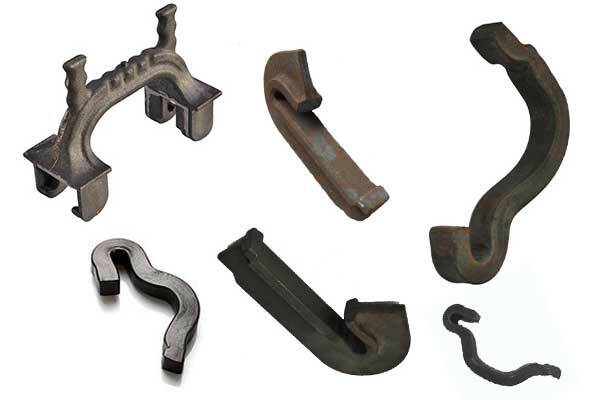 Russian rail anchor is often used in railways by casting, which is made from material of QT400-15. All related mechanical properties of it are strictly following with the standard of TOCT 7293-85.